For 167 years, The New York Times has been in the forefront of political reporting. This fascinating book, edited by the illustrious Andrew Rosenthal, captures the sweep and scope of the newspaper’s unparalleled coverage. In today’s turbulent world, The New York Times’s political reporting is more relevant than ever—not only for the news itself, but because of the paper’s high-profile advocacy for the freedom of the press. This anthology explores TheTimes’s political coverage from 1851 to today, examining what has changed and what remains the same. It includes everything from memorable campaigns and elections to controversial legislation, scandals, and issues ranging from immigration, race, and gender to the economy and war. 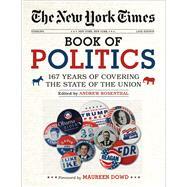 Compiled by famed New York Times editor Andrew Rosenthal, this compelling volume contains approximately 80 stories, 45 illustrations, and commentary and annotations. Andrew Mark Rosenthal is former editorial page editor of The New York Times and oversaw the editorial board, the Letters and Op-Ed departments, and the Editorial and Op-Ed sections of NYTimes.com. In March 2016, he became an op-ed columnist and podcast contributor for The Times. He was recently the Visiting Murrow Lecturer of the Practice of Press and Public Policy at Harvard.